This musically and graphically enriched chamber novel is an over-the-top black and blue comic extravaganza about the conspiratorial undoing of a teenage entitlement princess. The story throbs throughout with an undercurrent of apocalyptic motifs related to the extinction of art, fall of empire, and coming of the Antichrist. It is an epic farce that reads like an erotically supercharged psychological suspense thriller. The narrative takes the reader/audient on a veritable boomerang roller-coaster ride (with multiple inversions) through a reputational strip-and-whiptease of the novel’s malignantly artful (albeit ingenuously doe-eyed) protagonist: a wealthy young heiress and socialite who boasts an exclusive claim to her progenitors’ munificent estate. Her inheritance comprises an immense fortune amassed through shareholder investments in the world’s largest employment recruiter: the multi-national temp agency behemoth known as the Pleasant Peasant Corporation. 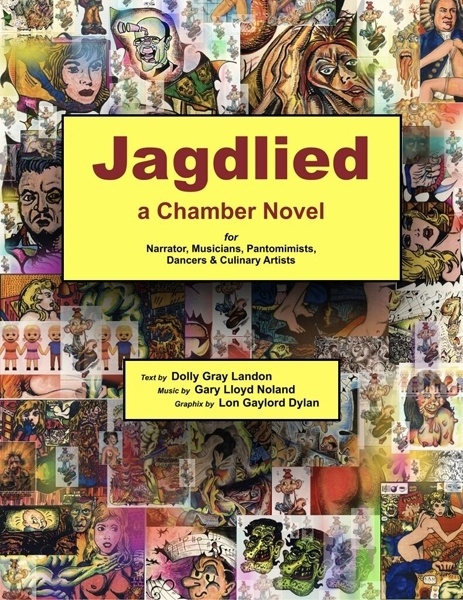 The character-driven narrative of Jagdlied explores themes of jilted love, misinterpreted motives, paranoid ideations, bombastic egos, ghoulish envy, smoldering jealousy, unconscionable revenge ploys, extravagant public humiliations, ruthless power games, insatiable greed, pernicious corruption, feigned moral outrage from all sides, and even (Heaven forfend!) coldblooded murder—all the type of stuff pre-calculated to magnetize your run-of-the-thrill-seeking bookworms and bibliophiles.